Abstract : Depictions with traditional media such as painting and drawing represent scene content in a stylized manner. It is unclear however how well stylized images depict scene properties like shape, material and lighting. In this paper, we describe the first study of material perception in stylized images (specifically painting and cartoon) and use non photorealistic rendering algorithms to evaluate how such stylization alters the perception of gloss. 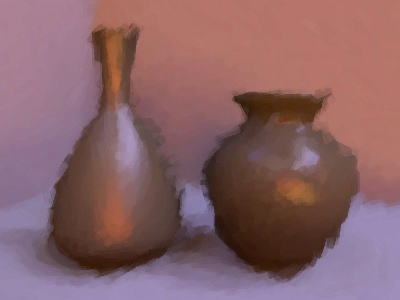 Our study reveals a compression of the range of representable gloss in stylized images so that shiny materials appear more diffuse in painterly rendering, while diffuse materials appear shinier in cartoon images. From our measurements we estimate the function that maps realistic gloss parameters to their perception in a stylized rendering. This mapping allows users of NPR algorithms to predict the perception of gloss in their images. The inverse of this function exaggerates gloss properties to make the contrast between materials in a stylized image more faithful. We have conducted our experiment both in a lab and on a crowdsourcing website. While crowdsourcing allows us to quickly design our pilot study, a lab experiment provides more control on how subjects perform the task. We provide a detailed comparison of the results obtained with the two approaches and discuss their advantages and drawbacks for studies like ours.